A pensioner has discovered a patch of the sea off the coast of Sussex that is as warm as Caribbean waters. 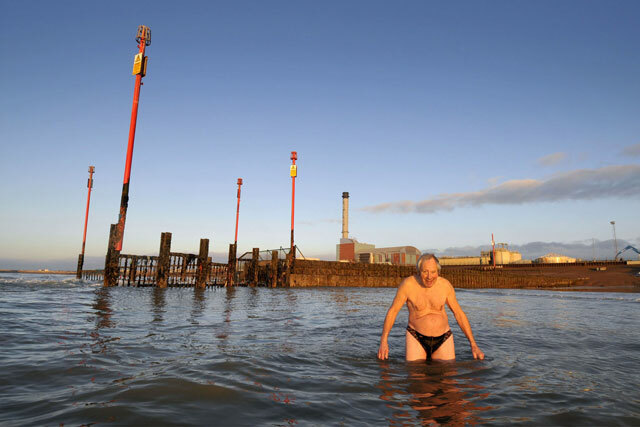 John Kapp, 76, goes for a swim every day in the football field-sized stretch of water, which can reach up to 20C. The former engineer believes the heated stretch is a result of water coming from the outflow of the nearby Shoreham power station. People not in the know watch in amazement as John takes to the apparently icy waters in just his trunks for a 45-minute swim. According to John, during the summer the sea never normally gets above 17C. However, the waste energy from the power station means that even on the coldest day he can enjoy water as warm as a bath. In total, seven tons of sea water is pumped per second through the condensers of the power station. Despite enjoying his daily swim John would like to see the hot water put to better use. He is a member of the Hove Civic Society, which is campaigning for the heat to be recovered from the water and used in nearby homes and businesses. John will be appearing on the E&T home page later today in our Big Picture image carousel (halfway down the page, enjoy the scrolling), as we salute his aquatic endeavours. Check it out, along with other striking engineering images.